She’s researched it, written about it and presented her findings in front of well-educated strangers at three separate conferences. Meanwhile, she has been the coordinator for two projects at the Human Biomechanics and Physiology Lab at High Point University. That is her home away from home. She does love that place because it figures so much into her future. Holt will graduate in May with a degree in exercise science and a minor in psychology, and next fall, she’ll begin a doctoral program in exercise science. Holt is a go-getter. 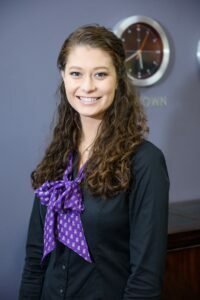 She is a Presidential Scholar, a member of two honor societies, and she’s held leadership positions with the HPU biomechanics lab, the Campus Concierge and in her sorority, Sigma Sigma Sigma. 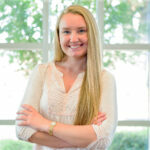 She now has been selected as HPU’s Extraordinary Leader for the month of December. There was a time Holt once doubted she’d ever get this far. Ask her about it, and she tears up. She realizes how far she has come. Anyone who hears her story will feel the same way. 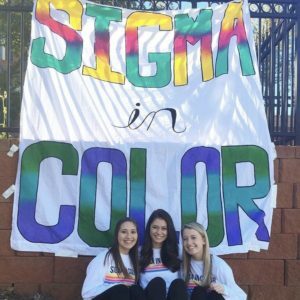 As a member of Sigma Sigma Sigma, Holt participates every year in Sigma In Color, a 5-K event that raises funds for the March of Dimes and gives Holt and her sorority sisters to throw powder at runners. At 14, Holt wondered if she’d make it to 15. She had constant migraines, she fainted frequently, and some of her falls gave her a concussion. She doesn’t know how many. Meanwhile, no doctor could give her or her parents a handle on what was happening with her health. Holt, ever the curious one, did her own research. Everything she discovered was grim. She and her parents saw at least 12 doctors, and her condition kept her out of school for months at a time. A tutor came to Holt’s home in nearby Greensboro several times a week and brought her schoolwork to her in the fall of her sophomore year and the spring of her junior year. Meanwhile, she took medication. But not all of it worked. Finally, after two years of not knowing, Holt found something. A doctor gave her ailment a name – autonomic dysfunction, a condition that affects the nervous system and how the body regulates heart rate, blood flow, digestion and body temperature. Holt with two of her sorority sisters, Meagan Gear (left) and Tori Bartley (right), during the 2016 Sigma In Color. She did – but not with medication. She relied on something known as biofeedback. It’s a technique that shows people how to know their body and harness the power of their mind to gain more control over their health. She learned how to manage her migraines and prevent fainting. Holt did that by monitoring her vital signs using biofeedback equipment. So, if she felt a fainting spell coming on, she knew what to do: Sit down, control her breathing using biofeedback techniques to slow down her heart rate. There is no cure for autonomic dysfunction. But she felt she had it under control. 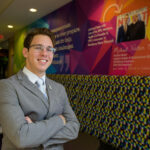 Holt has worked as a Campus Concierge sine May 2016. Holt came to HPU because of its biomechanics lab, its exercise science program and its proximity to home. Her parents wanted her to stay close, so they could be close because they worried about her health. 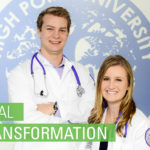 At HPU, Holt excelled. 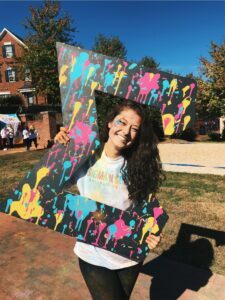 She made the dean’s list every semester, she joined Sigma Sigma Sigma and participated in the Big Brothers Big Sisters of the Central Piedmont. She befriended a third-grade girl at a local elementary school. The little girl had a head full of curls; her parents came from Honduras. Holt helped her with homework, played with her at recess and sat with her at lunch. When they would meet, the little girl beamed. At HPU, she also got busy with research. She worked with Drs. Kevin Ford and Yum Nguyen on their research and coordinated two projects – the knee injury risk identified in soccer players ages 9 to 19 and how well cleats performed with high school football players. Adidas funded the cleats project. She presented her research at UNC-Chapel Hill as well as on campus at HPU’s Research and Creative Works Symposium. 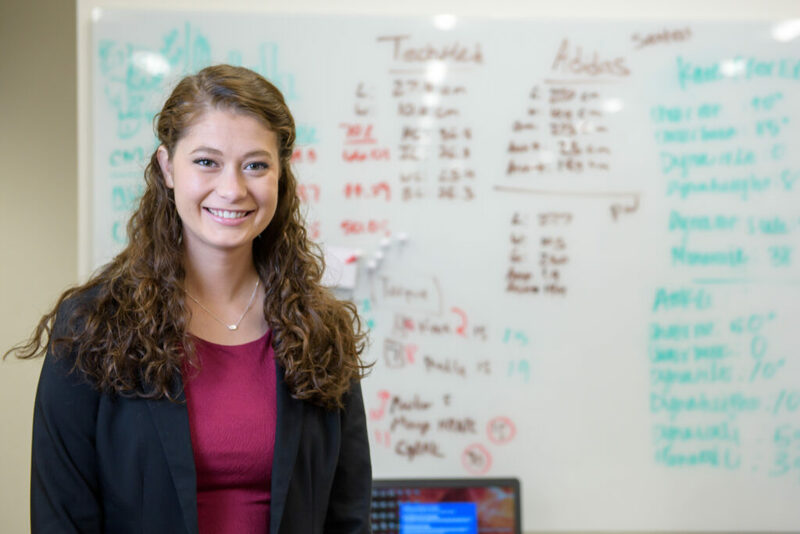 Her most nerve-wracking presentation came a few weeks after her junior year when she attended the annual meeting for the American College of Sports Medicine in Minneapolis, Minnesota. She gave a presentation in one of the sessions to a room full of experts. She was the only undergraduate, the fourth of nine people scheduled to present. She took a deep breath. “You’ll be OK,” she told herself repeatedly. That day in Minneapolis, Holt felt she was ready. In the fall of 2017, she spent a semester abroad studying at the Royal Melbourne Institute of Technology in Melbourne, Australia. She studied exercise science and got to do what she always wanted: Go to Australia. In August 2017, as she began her study abroad semester, Holt visited Uluru in central Australia. “It’s the most incredible thing I’ve ever seen,” she says. She had saved her money for five years. But it was bigger than that. She wanted to travel, to see things and do things without worrying about her medical history. Her parents were nervous about their youngest child, one of their two daughters, going so far away. Holt wasn’t. She discovered beauty like she had never seen before. Like Uluru, a massive sandstone monolith in central Australia. She also discovered something else even more poignant. “I can do whatever I set my mind to,” she says. And so, that day in Minneapolis, that is what she did. 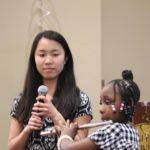 She gave her presentation and continued unruffled even when she heard whispers ripple through the audience when she answered a question and Dr. Nguyen followed up. She later found out what those whispers were all about. The audience couldn’t believe she was an undergrad. Afterward, a doctoral student came up and congratulated her. Then, Holt looked at her Fitbit. Dr. Nguyen sent her a text message. It was two words in capital letters. Holt has come a long way. She’s has trained 25 concierge students, taken families on campus tours and cold-called 15 universities to find out about their doctoral program. 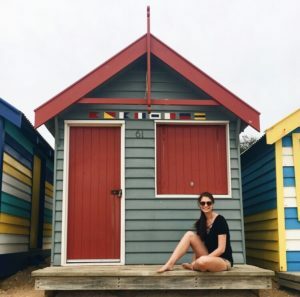 During her study abroad in Australia, Holt visited what is considered a “Melbourne Icon,” the Brighton Bathing Boxes, 82 multi-colored boxes a few dozen steps from the sea. 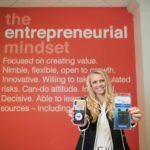 She’s traveled halfway around the world by herself to a place she always wanted to go, and she’s stood in front of a crowd of exercise science experts and held her own. Holt wants to use her doctoral research to study how biofeedback techniques can treat people suffering from concussions and traumatic brain injuries. She’s been there. So, she knows. And she wants help people feel better.